We are very familiar with Steve Jobs, Bill Gates and Mark Zuckerberg. When talking about them, we always come up with 1 word -- geek. In the dictionary, geek refers to a person who is preoccupied with or very knowledgeable about computing. It's about time we redefine the meaning of geek. Nowadays, a geek is a man that pursues his/her best not inly in computing but also in dressing. To achieve this, Romwe has launched a new product -- the Geek Print Grey T-shirt. And what's more? 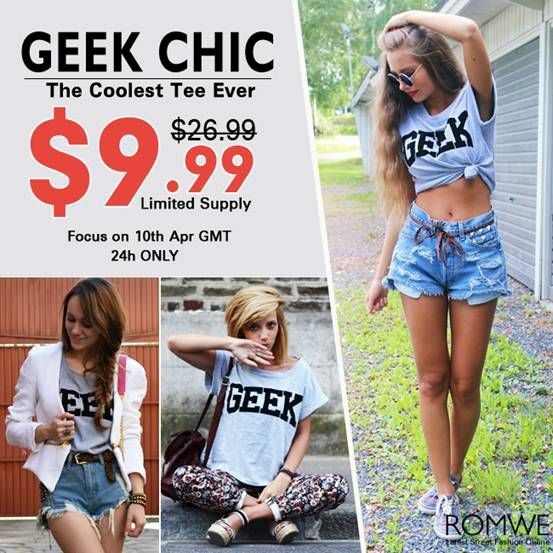 Romwe is offering us their "GEEK" T-shirt for only $9.99 today! This “geek” tee is surely perfect for Spring and Summer! The color of the shirt goes well with not only your denim shorts or pants, but also your skirts or leggings. This shirt could be upstyled or down-styled, whichever style suits your personality. Get YOUR OWN "GEEK" T-shirt only at Romwe.com! Please click here!